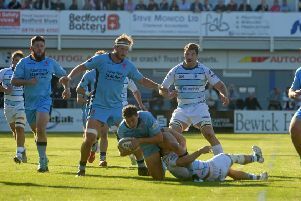 Goldington Road will open its gates to Steve Bates’ England charges as they prepare to face the Azzurri in the fourth round of the competition and the day before the senior sides battle it out at Twickenham. Blues’ chairman Geoff Irvine said: “We are thrilled to be able to play host to some of the best up-and-coming talent that England and Italy have to offer and I’m sure we are set for a wonderful evening of rugby. “The U20s Six Nations tournament has grown so much over the years and it is an excellent opportunity to see the stars of the future. “Bedford is an extremely special town for so many reasons, but the fact that we have the largest concentration of Italians in Britain will make this a very special fixture at Goldington Road. England U20s, who last won the tournament in 2017, finished runners-up to France in this year’s competition. Pathway performance coach Bates said: “This is a really important tournament for the players’ development. They are exposed to a highly-competitive tournament on the international stage, where the intensity of the games and scrutiny they’re under is different to anything they would have experienced before. “It also gives them the opportunity to prepare, interact and play with players they don’t know very well and build a cohesive team very quickly. “As potential senior internationals, it is something they will have to get used to and this tournament is a great introduction to that. Tickets are on sale now and people can save up to £4 by ordering in advance from the Blues’ website.